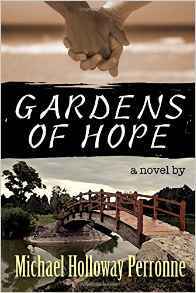 We're happy to be hosting Michael Holloway Perronne's GARDENS OF HOPE Blog Tour today! Please leave a comment to let him know you stopped by! On the surface, Jack appears to have all a man in World War II era 1941 could want with his solid middle-class background, upcoming college graduation, and the perfect, devoted fiancee. But one night when he accidentally stumbles upon a shadow life of men who desire other men in a Downtown Los Angeles park, he begins to realize exactly what has always left him with a feeling of emptiness. Despite the constant danger of being arrested by vice cops, Jack continues to visit the park every chance he has to feel a connection, no matter how fleeting, with another man. One night he meets a handsome and charismatic Japanese-American, Hiro, who appears to want more than a quick encounter, and Jack surprises himself by starting to truly fall in love for the first time. However, after the bombing of Pearl Harbor, President Roosevelt issues Executive Order 9066 and orders the mandatory relocation of over 100,000 Japanese-Americans, who have never been charged with a crime, to far flung internment camps sites. Jack and Hiro suddenly find themselves torn apart before their secret, fledgling romance can blossom. Desperate to find and reconnect with Hiro, Jack accepts a high school teaching position at an internment camp in the California desert, Manzanar. There, surrounded by armed guard towers and a prison-like environment, Jack begins to fully realize the injustices being faced by Japanese-Americans during one of the most controversial times of United States history and shifts his world view- forever. I stuffed my hands in the pockets of my pea coat and continued to walk faster and faster toward the park, fast enough that I began to sweat even though it had turned downright cold at this point. I walked by the May Co. Christmas window displays with their Santas and snowmen and wondered how anyone could have a jolly holiday now knowing the danger that threatened us all after the attack on Pearl Harbor. Sure, we had been listening daily to the news on the radio describing bombings in Europe, but I knew that having a mass attack on American soil woke many people up to the fact that we were not immune to the violence or the war. When I eventually reached the park, it was dim and looked deserted. Usually there were a few men milling about and trying not to look obvious about why they were there and a few other people who had come there simply to go to the park. Maybe everyone was as shaken up by the bombing that they were staying home with their families—which is probably exactly where I should have been if I hadn’t been so weak, I admonished myself. Finding the park so deserted felt like another kick to my stomach. There was no way to run from or ignore my feelings at the moment, and defeated, I slumped down on a park bench by myself. I could hear the distant voices of people walking outside the park and even a few laughs. I wondered if the laughing people had heard about the bombing yet. News traveled much slower back then with no TV or Internet. It was possible to be “out of the loop” for a period of time when it came to bad news. Now it just hits you like a high-speed train throughout the day with one breaking news story after the next. I looked up at the clear sky, and even with the city lights, some stars shone brightly. I knew I should probably be with Sally, my family, or friends instead of by myself in this deserted park in Downtown, but none of them would understand all the confused feelings I had swirling in and dominating my brain. I didn’t even understand it all. Suddenly, I heard a loud chirping sound and felt a small but sharp peck on the top of my head. “What the….” I started to say. The bird loudly squawked again before diving down and pecking at my head again. I threw up my arms and waved them around to scare off my tiny attacker. That’s when I heard a chuckle coming from across me. In the dim light I could make out another man. Back then, he would have been referred to as Oriental. He was a few inches shorter than me and about my age with short-cropped black hair, and I could see his wide smile even in this light. “You must be near her nest. That’s why she’s attacking you. They do that sometimes. I’d move if I were you,” he said. Quickly, I got off the bench and walked toward him, and the bird stopped attacking. As I got closer, I got a much better look at him. He had broad shoulders that hinted at a somewhat muscular body. He wore a black knit sweater with fitted gray slacks. His cheeks had dimples when he smiled, and just his gaze on me quickened my heart. The more he came into focus, the more I saw how incredibly handsome this man looked, even bordering on the term pretty. “Sorry, but I couldn’t help laughing,” he said, his smile growing bigger as I got closer. I paused and continued to look at him to see if I could recognize that tell-tale look in his eyes and the possibility that he had ventured out here by himself for the same reason I did. Even though anything resembling a real conversation had been short, I had heard from a couple of the guys I met up with at Pershing Square to keep an eye out for the police who showed up on occasion to make sure nothing happened in the bushes and grass that shouldn’t. Some men’s arrest reports ended up in the newspapers and their lives were basically ruined. One man described the arrest and beating in the park of a guy with premature salt-and-pepper hair and bright blue eyes. I immediately recognized his description. The two of us had gone off together just a couple of nights prior. My heart fluttered. His comment did strongly hint at something. Maybe he was here for the same reason as me. This young man with his warm smile could help me forget….at least for a few moments. In his arms, I would be able to block out the rest of the world just long enough not to feel so low about myself. I wanted to take him to the back of my parents’ shop. I wanted to run my fingers through his black crew cut, let my hands run up and down his arms to feel his masculine torso, and pull him close to me enjoying the buildup of warmth between our bodies. “What’s your name?” he asked, his eyes darting around every now and then to stay aware of who was around. “Jack,” I managed to say. All I could think about at that moment was how badly I wanted to kiss him and taste his lips. I could now see a bit of stubble on his check that I wanted to stroke with my fingers. Michael Holloway Perronne is the author of eight books including: "A Time Before Me," "Falling Into Me", "A Time Before Us, Men Can Do Romance" "Gardens of Hope," and"Embrace the Rain." His debut novel, "A Time Before Me" won the BronzeAward, Foreword Magazine's Book of the Year Award in the Gay/Lesbian fiction category. the University of Southern Mississippi and a MFA in Drama and Communications from the University of New Orleans. ​He currently resides in Southern California and is working on his next novel, "The Other Side of Happy." His recent release is Gardens of Hope.